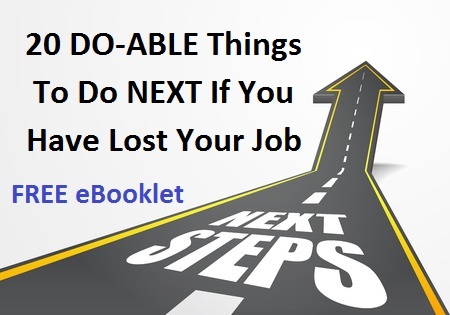 This eBooklet is almost complete and will be published here soon. The next 20 Things to do are so important and based on my personal experience. I want to make them right! so it has taken a little longer than expected. and I'll send it to you as soon as it is published here. You will find it very useful. In the mean time, have a look at the TODAY tab above (Coping With Today and Feelings) if you are recently unemployed or undergone a redundancy, or the FUTURE tab if you are thinking of changing careers. Thankyou so much for visiting.